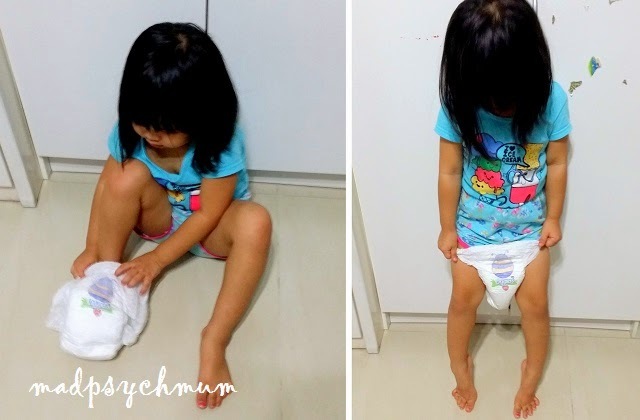 MadPsychMum | Singapore Parenting + Travel Blog: If the Diaper Fits, Wear It! If the Diaper Fits, Wear It! When you are a mum of two kids, with lots of things to buy and bills to pay, every little bit of savings count. I don't know about you but as someone who does not like to waste anything, I'd hate to have to give away diapers that are in a size that my kids can no longer wear because they have outgrown them. So how do you know when to change from size M to L? Well this comes with experience and keen observation. Case in point, Baby Boy is starting to outgrow his current diaper (if you see his chunky thighs, you'd understand why). 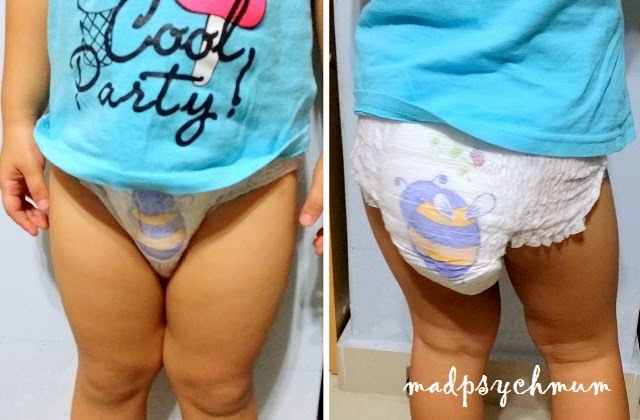 In general, the moment we notice that diaper is starting to cause pressure marks, we would buy a bigger size in our next purchase so that we don't waste money (better for your baby to wear a slightly bigger diaper than a diaper that is too small). And if you have a toddler like me, trust me, life is so much easier when your kid knows how to put on her own diaper. Even before putting on the diaper, ensure that your child stretches it out both at the top and at the bottom of the diaper pant to "loosen" it before putting it on. This will ensure that the gathers of the diaper will not be folded inwards and "clip" your child's skin. 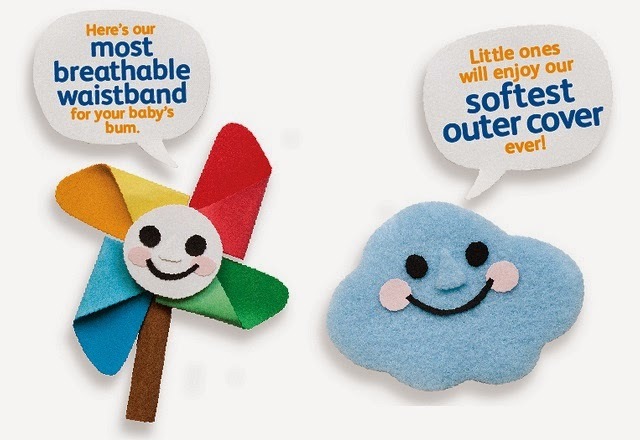 You may need to remind your child repeatedly to stretch out the diaper because there is a high chance that they will not remember (hopefully over time, they will no longer need any reminders =P). Teach them to distinguish between the front and the back (and as an OCD mum, I'm very particular that she gets it right! *laughs*). Get your child to sit down when putting on the diaper as it's a lot easier. After they've inserted their legs, all they need to do is pull it up! Put it in (left) and pull it up (right)! Remember to check the fit around the thighs and waist because if the diaper is worn incorrectly, it may leak (it did a couple of times when we forgot to check). A comfortable and stretchy waistband is also very important to ensure that the diaper fits just right without causing any discomfort which, as we know, is simply a recipe for disaster. 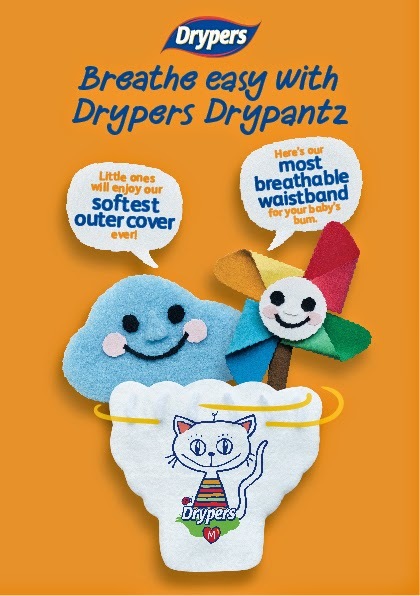 Breathability and Softness can be achieved with the cloth-like Comfort Fit™ waistband and softer outer cover of the Drypers Drypantz that provides ultimate comfort for your child. To illustrate this, meet Dryper's cute mascots, Airy and Softie! 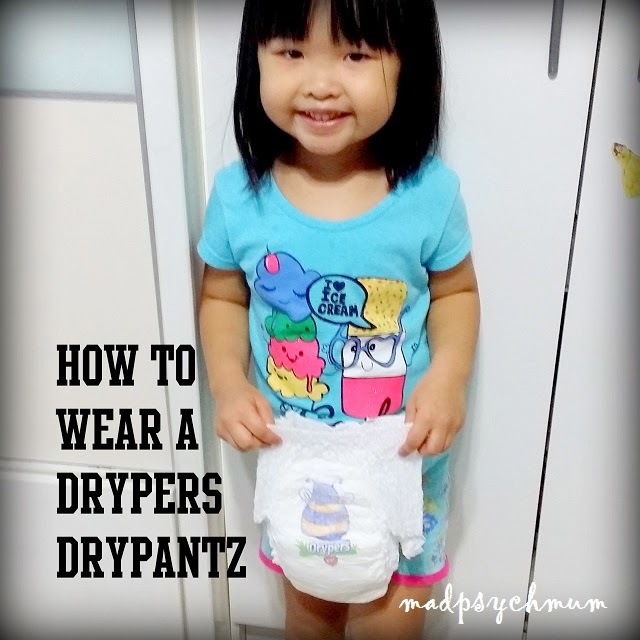 If you are keen to try the new Drypers Drypantz, simply visit Dryper's Facebook page and request for them! For the month of July (2014), you can buy a pack of Drypers Drypantz for a special price of $10.95 each at major hypermarts and supermarkets (sizes available: M44, L36, XL32, XXL28)! 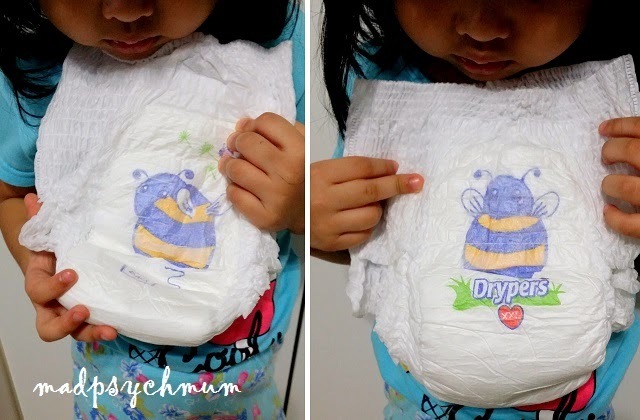 Play the “Breathe Easy Breeze” game on Facebook, where you'll have to control Airy using your mouse to help Softie turn plain diapers into Drypers Drypantz! 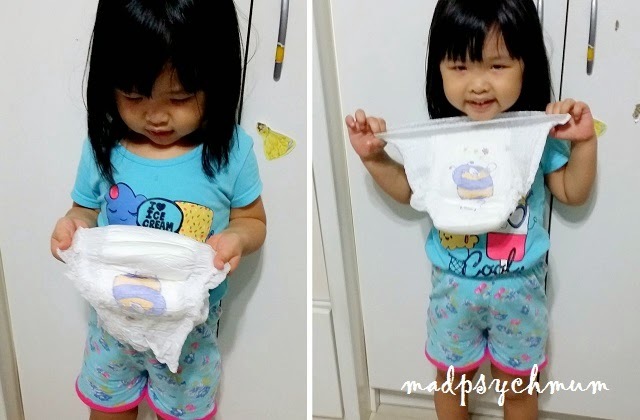 Convert 12 diapers to Drypers Drypantz in the fastest amount of time and the top scorers each week will stand to win prizes such as $100 cash vouchers or tickets (worth $88 each) to Lunchbox Theatrical Production’s “Bubble Magic” show. Disclosure: This is Part 4 of a series of sponsored stories on behalf of Drypers Singapore. All opinions are my own.